This post is going up late...but voila! The first 2 months of the year meant a fresh start and a new commitment. I was determined to empty out all my drawers, and finally be able to throw away bottles/packets/jars without feeling guilty. So be warned, this is another long post. Normally I am not too fussed about haircare products but lately I've had a bad run with shampoos/conditioners and even treatments. This L'oreal Elvive Nourishing Shampoo did not make my hair feel less lifeless or even clean. Then I found that I did not like the Garnier Oily Roots Dry Ends shampoo/conditioner very much despite it sounding perfect for my hair type. It did nothing for my scalp and super dead ends. It felt like this was the month of face cleansing as I was obsessed with removing every speck as I was breaking out so much. I did not have much left in AC Care Bee's Foam Cleanser so I wasn't able to use it to help control my symptoms. You guys may already know how I feel about the Tony Moly Dr. AC Control Bubble Cleansing Foam but towards the end it seemed like the "potency" decreased dramatically. It was no longer cleaning as well and the pump kept malfunctioning so I wasn't about to dispense the foam like I used to. 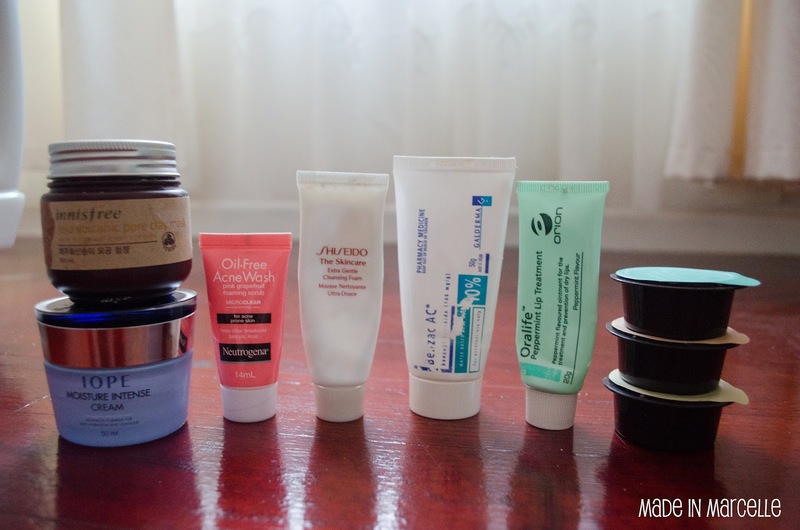 The St Ives Apricot Scrub is definitely a regular in my empties. I actually like using this on my body as well (which means I use it up even quicker). It has taken me so long to finish the Aquamoist White Washing Foam, which I found average at first. But then I came to realise how clean it made my face and absolutely brilliant at removing residue makeup. Although there are times when my face felt tight after cleansing. One of my weaknesses is another grapefruit scented. I haven't really used many Nature Republic products before, so the Nature Republic Fresh Form Foam Cleanser Grapefruit was a random pickup. A very average cleanser but it smelled so fresh. Although this can leave a soapy residue after washing with water. 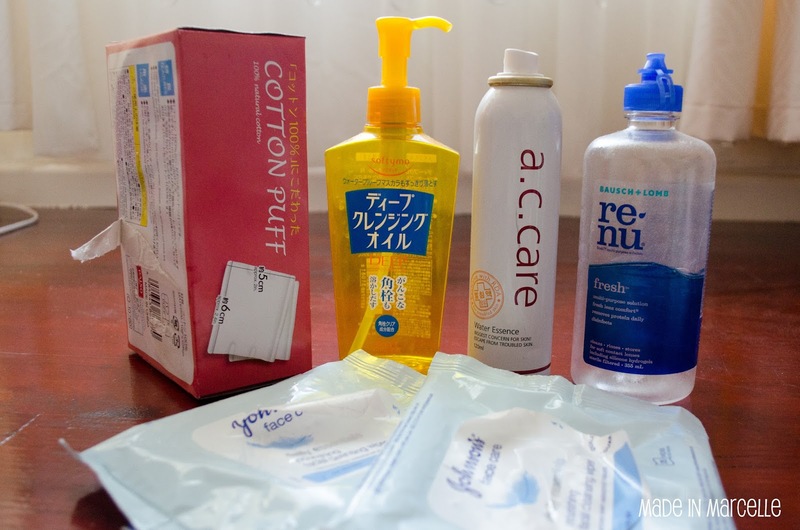 More makeup removal products include the super cheap Daiso Cotton Puffs and the Johnson's Daily Essential Facial Cleansing Wipes which I bought in a 3 pack. Not my favourite wipes and I really did not like the scent initially. I absolute loved the Softymo Deep Cleansing Oil which removed all my makeup so well, including waterproof mascara. This AC Care Water Essence was probably my least favourite product of the range. I did not gravitate towards it much and found myself using my witch hazel more. It's not often that we talk about eye care but I decided to include one of my Renu Fresh Multi-purpose Solution which I use everyday to soak my contacts. I have yet to find a "HG contacts solution" as they all feel the same. I just buy whatever is on sale at the time. When my skin started to freak out suddenly, I decided to use my Innisfree Jeju Volcanic Pore Clay Mask, which has cleansed my face so well in the past. What I did not account for was how long I've had this jar for. This actually irritated my skin even more and I ended up with more spots. It is definitely time to throw this half used jar out. Another favourite product, the Iope Moisture Intense Cream, makes my skin so lovely the next morning and does not look overly greasy if I want to use it as a day cream. Some decently sized sample face cleansers that I finished were the Neutrogena Oil-free Acne Wash Pink Grapefruit Foaming Scrub, surprisingly really good, and the Shiseido The Skincare Extra Gentle Cleansing Foam, which foamed up a lot and left my skin very soft. But not enough for me to buy the full size (plus it's expensive). An essential in my skincare is the Benzac AC 10% which I have been using with prescription medications to get my breakout under control. I actually think this Oralife Peppermint Lip Treatment is the first ever lip balm that I've fully finished because usually they go missing. These little containers stacked on the side are the Innisfree Capsule Recipe Packs which I will be doing a full post on them soon. I have a few more to use up before I can let you know what they're like. Face masks of this month were The Saem sheet mask (surprisingly moist for a freebie), Innisfree Pomegranate Mask (stung a little initially), My Beauty Diary in Earl Grey Tea & Macaron, Chocolate Truffle and Black Pearl (nothing spectacular results with these) and finally the FaceQ Luffa + Adlay. None of which stood out to me. I'm slowly working my way through my numerous samples too. Innisfree Apple Juicy Brightening Peeling Gel did not remove as much as some of my other peeling gels, the Tony Moly Tomatox was meh and the Skinfood Good Afternoon Rose Lemon Tea BB faded from my face too quickly. There you have it, another month and another empties. I'm wondering whether I should do these more often so that the posts don't get so long. Then again, Court does hers in between too, which may mean empties overkill. Would that be too many? Thoughts? holy moly! I saw a few familiar products. I got the daiso wipes too, it's a little harsher than what I normally use, but it's such a bargain! 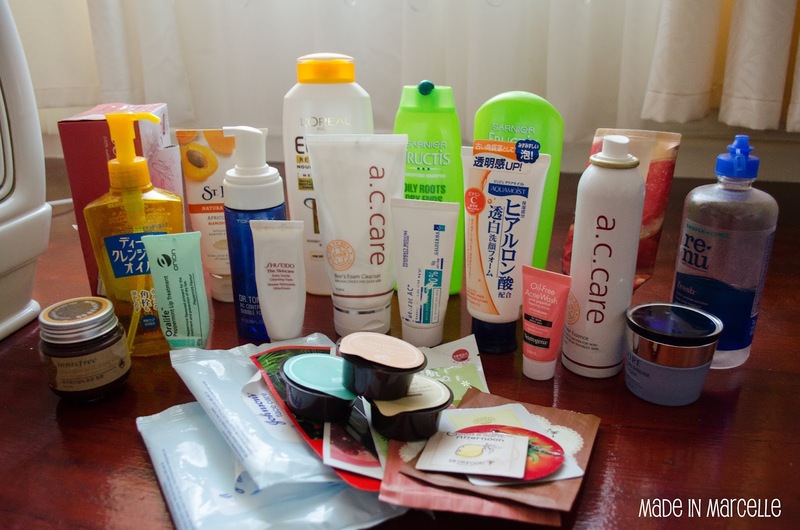 I realised that I have a lot of foreign products which most people would never have heard of (all thanks to the magic of online shopping). Yeah the Daiso ones can be quite harsh especially when my skin is really sensitive. But they work so well for removing nail polish also. Which ones do you usually use that are softer? I think I may need some like that. I remember seeing lots of other varieties in the huge Daiso in the city but none of them are as good as the ones in the pink box.